Nigerian Officials Say They've Located Missing Girls : The Two-Way More than 200 girls who were abducted by militants in Nigeria's northeast have been located — but Nigeria's military says it's too risky to try to free them by force. Nigeria's chief of defense staff Air Marshal Alex S. Badeh speaks during a demonstration in Abuja calling for the rescue of girls kidnapped from their school in Chibok. Badeh says the government knows where the girls are — but that a rescue attempt would endanger their lives. More than 200 girls who were abducted by militants in Nigeria's northeast have been located — but Nigeria's military says it's too risky to try to free them by force. The news comes after reports that the government had been negotiating for at least some of the girls' release. The U.S. and other nations have contributed manpower and resources to the search for the girls, whose mass kidnapping inspired an international campaign demanding their safe return. U.S. surveillance aircraft have taken part in the search, using sensors that can detect body heat in complex environments. "The teenage students were abducted from their dormitory beds almost seven weeks ago. "The military statement has given some parents hope that their daughters are still safe, and still in the country. But the military has made untrue claims before. In the days after the abduction, the military spokesman said that almost all the girls had been freed. That turned out to be false. "The government continued to rule out accepting an offer from Boko Haram's leader to exchange the girls for prisoners. Other Nigerian officials insisted that 'no option should be off the table.' "
The BBC is reporting that Nigeria and President Goodluck Jonathan had been close to working out a deal for some of the girls to be released, but that the government pulled back from the negotiations. 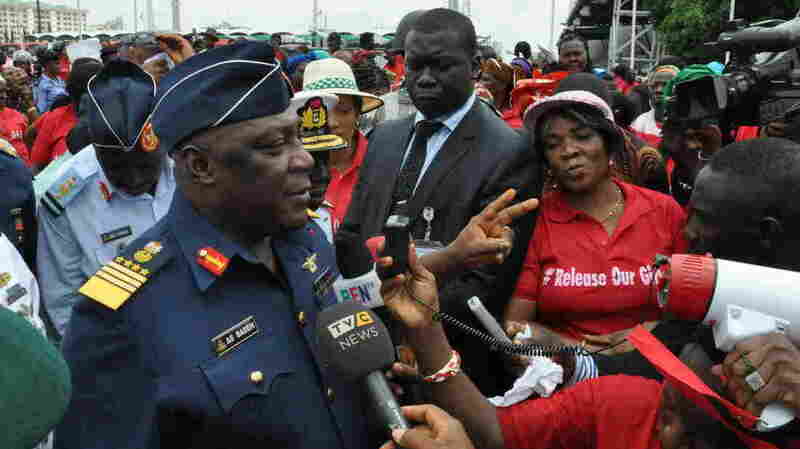 Badeh discussed the case Monday, as new demonstrations were held demanding the girls' rescue or release. "We want our girls back. We can do it; our military can do it. But where they are held, can we go with force? If we go with force, what will happen? They will kill them," he said, according to Nigeria's Daily Post. Defending the military's efforts to fight Boko Haram and rescue the girls, he said, "We can't go and kill our girls in the name of trying to get them back." "The good news for the girls is that we know where they are but we cannot tell you. We cannot come and tell you military secrets here." Two weeks ago, Boko Haram and its leader, Abubakar Shekau, released a video that it said showed the girls, in a message that included an offer to negotiate for their return in exchange for imprisoned militants. The video showed more than 100 girls gathered in a wooded area.